What needs to happen to go from constant fundraising mode to landing an investment to the tune of 20 million euros? You have to prove that your business idea works. That is exactly what Alexander Henn and Philip Magoulas, the founders of the Munich-based startup Shore, managed to do. It also allowed them to recently win over investors such as Funke Mediengruppe, the Metro Group and Bayern Kapital. What does Shore do? The Munich startup offers digitalization solutions for small, local service providers. Although solutions are available for specific sectors, the software-as-a-service concept from Shore along with the variety of products offered significantly distinguishes the startup from their competition as a specialist in B2B digitalization solutions. No one has a better understanding of how difficult it was to reach this point than Shore’s founder, Alexander Henn. He started with Termine24 – now known as Shore – and discovered time and again that the path he was on sometimes needed to head in a different direction to be successful. We spoke with him to find out more about what he learned during the process. 1. Take your time and find the right team! The logical result of that experience: Instead of relying on a high number of freelancers, Shore now employs a permanent team. They also take all the time they need when looking for suitable people to bring on board. The team now comprises just under 250 employees with plans for continued growth – but only with very clear objectives in mind, emphasized Alexander. The major focus is on IT. His attitude was pretty much set. That is, until he happened to meet Philip Magoulas in Berlin, who had been with Zalando since day one. What Alexander values so much about Philip is his enlightened way of viewing things. He also appreciates his startup boldness. It also helps that Magoulas knows how to scale a business from 10 to 1,000 employees while keeping the processes running smoothly. “Without him, Shore’s rapid growth would have ended in total chaos,” admitted Alexander quite frankly. What unites the two is their conviction that the digitalization of local services could become the next big thing. Their success certainly seems to confirm their belief. 2. Concentrate on one idea instead of working on three at the same time! Nonetheless, there is always a danger of getting lost in too many ideas – much like Alexander has seen happen to others in the market. This often leaves companies stuck in a niche. One of the reasons that has not happened to Shore is partly due to their sound product development. It is also because the Munich startup was fortunate enough to successfully enter the market right from the start. 3. Do not get stuck on things just because you planned them in the beginning! In addition to online booking, they also offer a module for customer management, a web module for creating an internet presence, an iPad-based POS system and much more. The individual modules can be combined to suit the client’s needs. 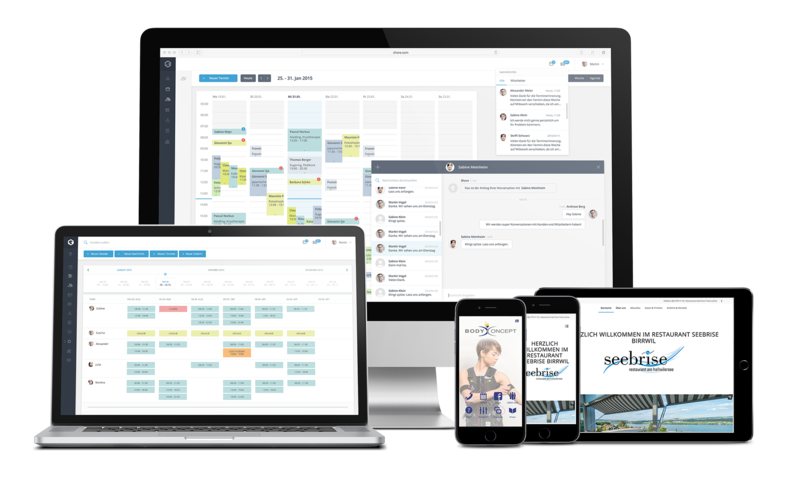 The objective of the Munich-based startup: When you have Shore, you will not need any other systems for digital management. Plus, sending out a newsletter should be just as simple as sending a text message. A clear advantage provided by the new strategic focus on their target group: A huge number of small enterprises such as hair salons, restaurants and nail studios are often just beginning to digitize their businesses. The corresponding number of potential leads is just as enormous. 4. Think strategically, and not just about tomorrow! 5. Gather your own experience! When it comes to having his company headquarters in Munich, however, he is completely satisfied. One reason is that Shore has “been able to stay under the radar for a long time in contrast to Berlin.” Employee fluctuation is also very low in Munich – people enjoy living and working in the Bavarian state capital. What do they have planned next? So things are looking good. Shore has also set the goal of being more than a Europe-based phenomenon. Indeed, initial signs of success can be seen in the US market. The latest investments will be used to further those developments. Alexander feels certain that new partnership opportunities might arise, especially because innovative software solutions come from the US. Shore plans not only to invest in internationalization, but also to expand the products they offer. Those developments do not always have to come from Shore itself. This idea is to become a marketplace for other providers. We will be excited to learn more about how things develop for Shore. One thing is certain – they are definitely no longer flying under the radar in Munich.